One of the truly unique things about living in Greater Lansing is the fact that we have one of the greatest University campuses nuzzled in amongst suburbia. Now I admit, I may be a bit biased (JMC class of 2007, holler! ), but this most definitely makes for a one-of-a-kind living experience- especially during football season. I am going to go out on a limb here and admit something that I had been trying to keep under wraps for some time now- I am not a big sports fan.While I attended my fair share of tailgates as an undergrad at MSU, and even ventured into the stadium on a rare occasion or two to catch the first half of a game, I tend to keep my Saturday afternoons reserved for a good book, hot tea and household chores. However, when my good friend Tim offered me up a ticket to last week’s Big Ten Opener against Wisconsin, I found myself saying “I’ll see you there”. I immediately became a bit hesitant and was not sure what I was getting myself into, but for your reading pleasure, I present to you my MSU Tailgate/Football recap! As you may recall, Saturday morning brought a light drizzle, cold temperatures and a post-Oktoberfest rough start for yours truly, yet I braved it all to make my appearance on campus. For many people, this may mean traveling across #puremichigan to make it for the start of tailgating; but for us lucky Lansingites this simply means walking a few blocks to the CATA station, hopping on a bus and making the short walk to the lovely MSU campus. After a small detour for the necessary Deckers coffee, my friends and I boarded the bus and started our day. Once game time approached I made my way to the MSU Stadium to get in line, where I was caught off guard by security when they denied me entrance because of the size of my handbag. Let this be a lesson that regardless of how fashionable one may try to be for the big game, it is crucial to keep in mind that you cannot bring in a bag larger than a brick. For some, this may be common sense, but for those of us newbies, it’s a lesson learned. 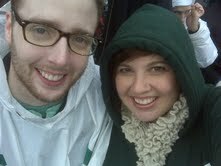 Enjoying the MSU Football game! Once I ditched the bag, grabbed a hot chocolate and found my seat, it was impossible not to catch the Spartan spirit which was rampant throughout the stadium. The energy in the packed sports arena is contagious and I truely believe that it can make a sports fan out of the most skeptic. As I looked all around me at the sea of green and white, and high-fived the strangers seated around me as we continued to make play after amazing play, I realized that the gameday experience is about more than just sports. It is about people all across the state coming together, showing comradery and celebrating the athletic achievements of our local sports team. My friends and I may not have been sports saavy, let alone able to follow every play of the game, but we were enjoying ourselves one and the same. Needless to say, I have caught some much welcomed Spartan spirit! From here on out, I will now be reserving a few hours of my Saturday afternoons to catch some of the games… and you may even see me at a tailgate or two. 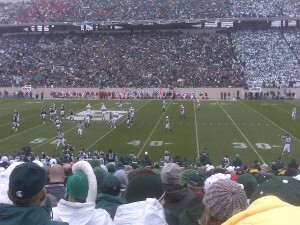 This entry was posted in City Life, Events, Sports and tagged MSU, Spartan Football, tailgate. Bookmark the permalink.